Beattie's Book Blog - unofficial homepage of the New Zealand book community: Steam Press is ecstatic !! 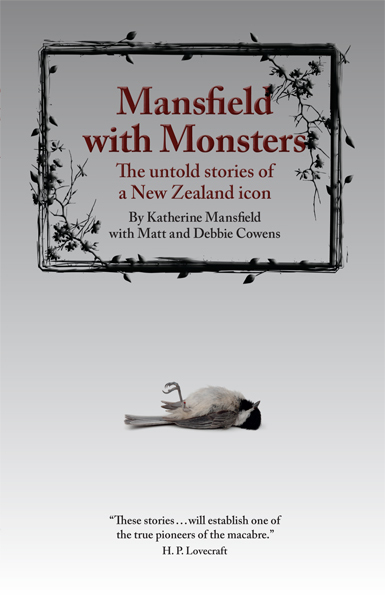 Steam Press is ecstatic to announce that Mansfield with Monsters, a book of Katherine Mansfield's short stories with cunningly interwoven alien invaders, zombies, and sea monsters, is one of the Listener's top 100 books of 2012. The book features seventeen of Mansfield's most popular works such as "The Garden Party" and "The Doll's House", with the characters in each beset by a different creature or supernatural horror. Simon Litten, one of New Zealand's most prolific reviewers of science fiction and fantasy books, was full of praise in his review of this book, stating that "if Pride and Prejudice and Zombies was a one note song then Mansfield with Monsters is a choral piece of depth and vibrancy" while the Listener's review called the book "grand fun" and noted that "you never know what the fantasy element in a given story will be, and the uncertainty transforms the reading experience delightfully". Kapiti Coast authors Matt and Debbie Cowens were over the moon when they heard that the book was listed in this year's top 100. "It's a bloody awesome Christmas present to make the list! For a book with the potential to polarise readers and reviewers we're delighted that so many have embraced the spirit of the book and not taken offence." Matt and Debbie are high school English teachers, and both are also authors. After years of decoding classic New Zealand fiction such as Katherine Mansfield's short stories for their students, they decided to try a different approach. "Mansfield's stories are beautiful, subtle, and mature –perhaps too subtle for some students. We kept the beauty and maturity, and populated the stories with lizard people, mummies, werewolves, and magic. We hoped that students would find a subtle theme easier to swallow when washed down with gallons of blood." They have certainly achieved that, and far more. The book has proved to be hugely popular – it has been reprinted twice since it was launched in July –with many readers now revisiting the original stories as well. "A lot of people are reading Mansfield with Monsters alongside her original stories," Steam Press editor Stephen Minchin says. "It's great fun reading these new versions and trying to figure out what Matt and Debbie have changed. Their work is so seamless that it's almost impossible to tell where they've added little hints about what's coming, and then a mummy lurches out of the undergrowth and you almost wonder if that's what Mansfield had been building towards all along." 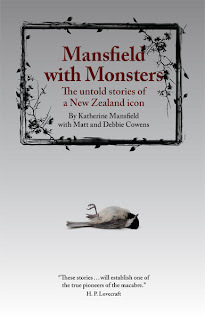 Mansfield with Monsters is available now from all good booksellers. stephen@steampress.co.nz or on 021 127 3925.